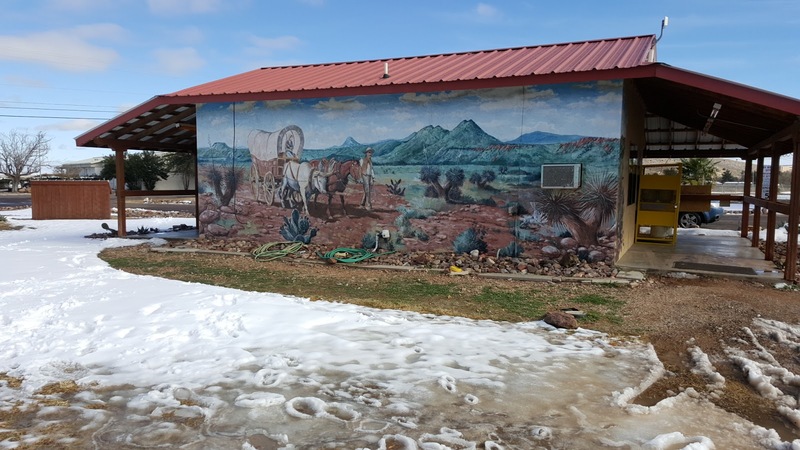 This is the back of the office at North Alaskan Rv Park in Alpine, Texas. 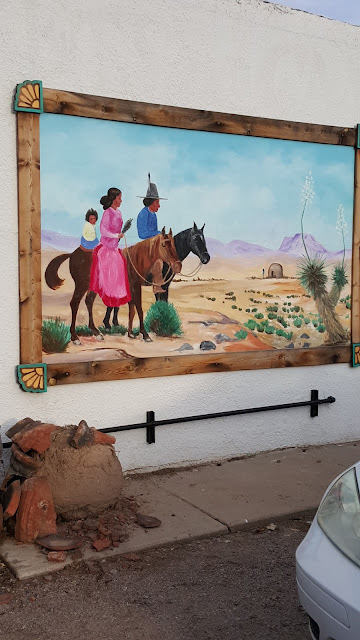 We have seen a number of towns and now RV parks that have some very nice murals. Often they are about the local history or people in the area. The snowstorm had closed a number of roads in West Texas. They do have snow equipment in the area, but not a lot. For example, businesses seemed to have shovels, but no small snowblowers or plows. For that reason we headed east to Route 67, north to Fort Stockton where we filled with $1.85 gas. 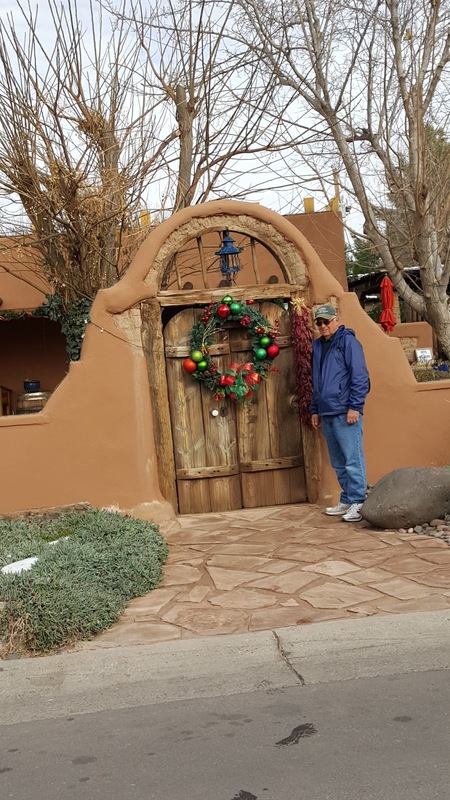 From there we headed up Route 285 to Pecos. Pecos was where we had our mail sent because we had this great idea to head up to Carlsbad Caverns on the way west. With the cold spell, not such a great idea. 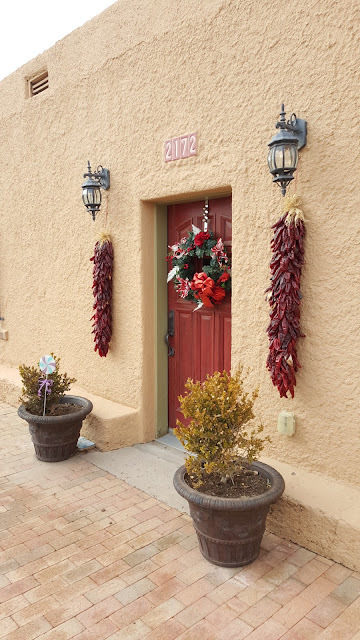 We were already below freezing at night , even in Pecos. Carlsbad had quite a bit more snow(higher elevation and further northwest)and was looking at possible single digit temps overnight. Maybe in the Spring. 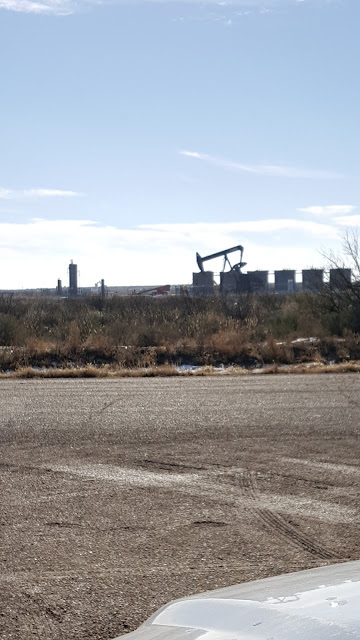 Very few people on the way to Pecos, but a number of oil rigs and storage facilities like in the above picture. Jan and I leave the next day on Route 20 west. 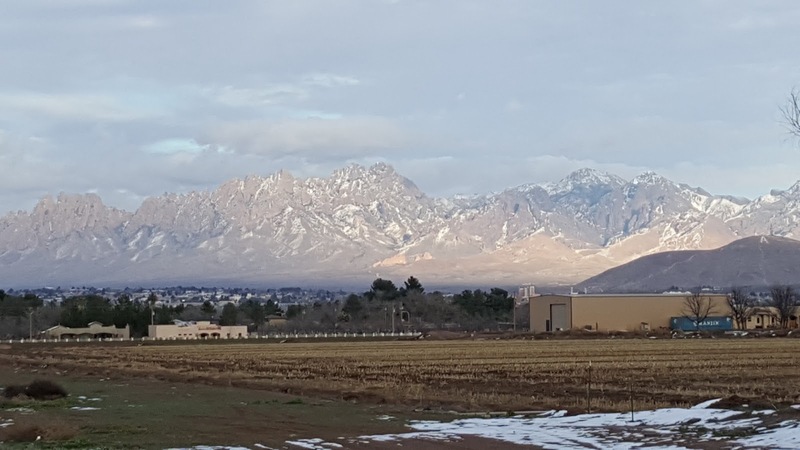 Route 20 joins Route 10 and we have a relatively quiet drive through El Paso to Las Cruces, New Mexico. On the way we stop for gas east of El Paso for $1.75 per gallon. What a difference! We usually fill when the gauge shows 1/2. That will be around 30 gallons. In the past 3 years we have paid as much as $4.35 per gallon. Some of you will not be surprised to know that was in California in 2014. 30 gallons at $4.35 is $130.50. 30 gallons at $1.75 is $52.50. BIG DIFFERENCE!!! Our stop here is at Hacienda RV Park. We have stayed here before. 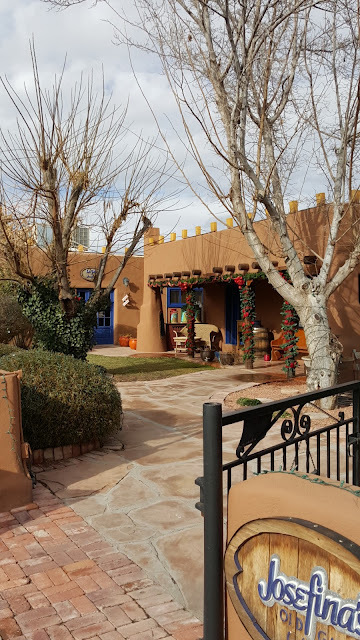 We like it because it is only a one and a half mile walk to the old town of Mesilla. 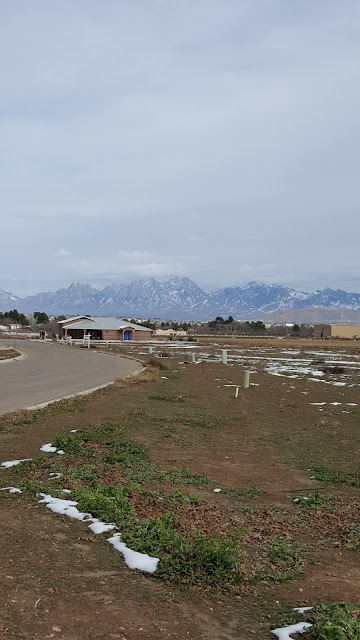 Along the way we have some of these great views of the Organ Mountains. 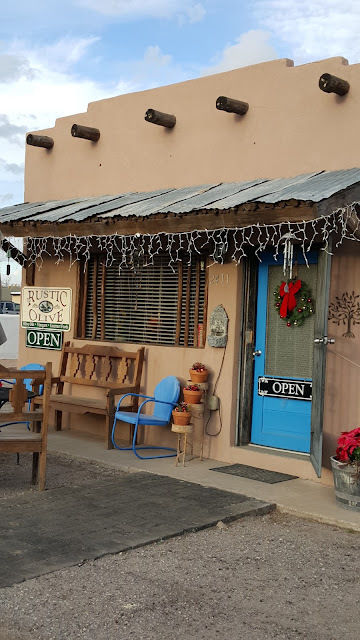 A nice variety of shops and restaurants in the old town of Mesilla. Jan is always happy to find a store like the Rustic Olive . A nice selection of olive oils and vinegars. Also a nice conversation with the store owner. 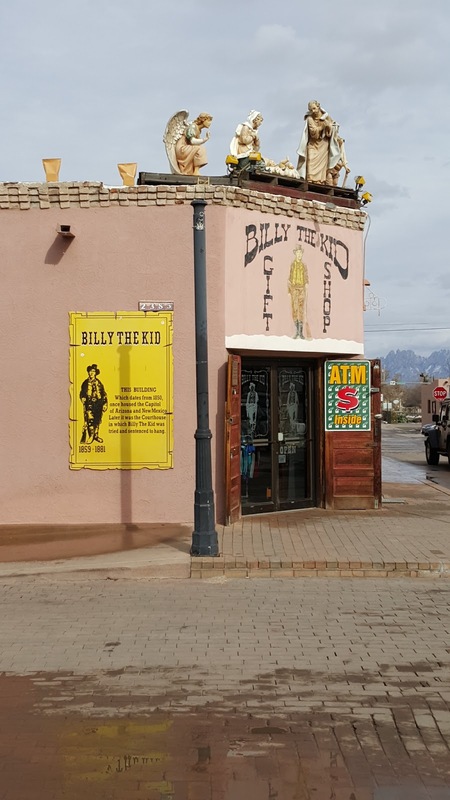 A surprisingly large restaurant with many rooms. These pictures of the Christmas trees are in different rooms. 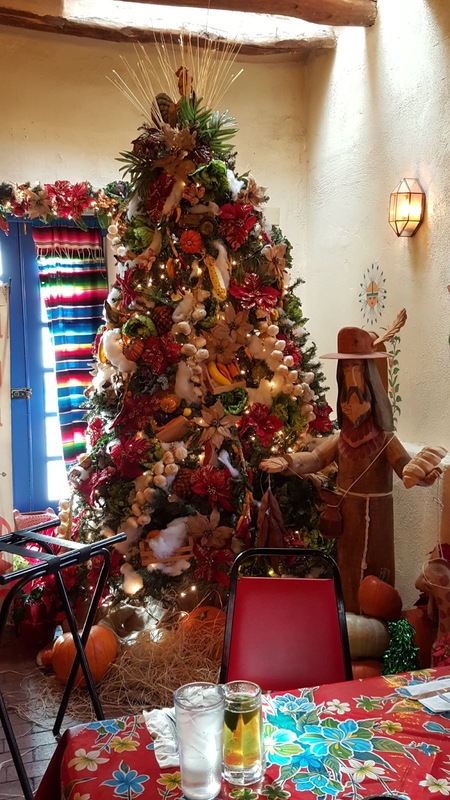 The decorations are Mexican and very colorful. 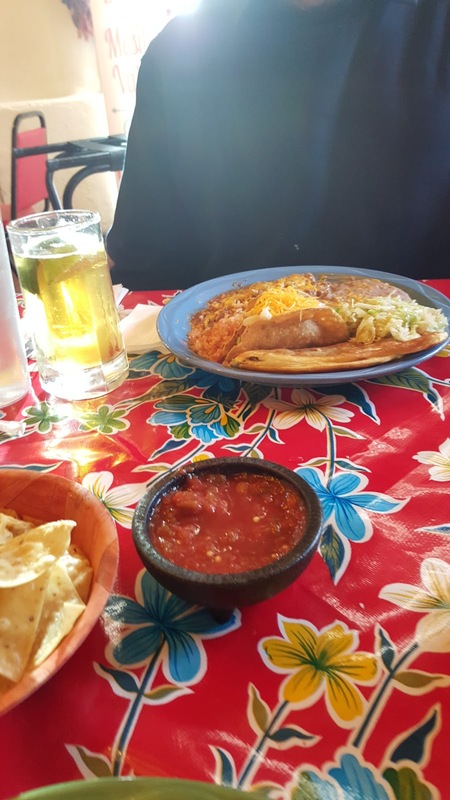 The one behind our table uses a lot of colorful peppers and spices. 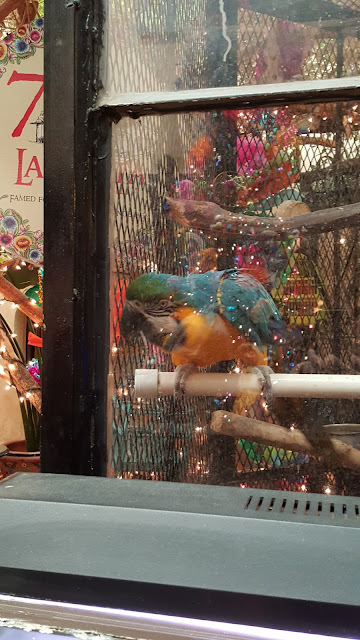 Also inside are some exotic birds and fish. 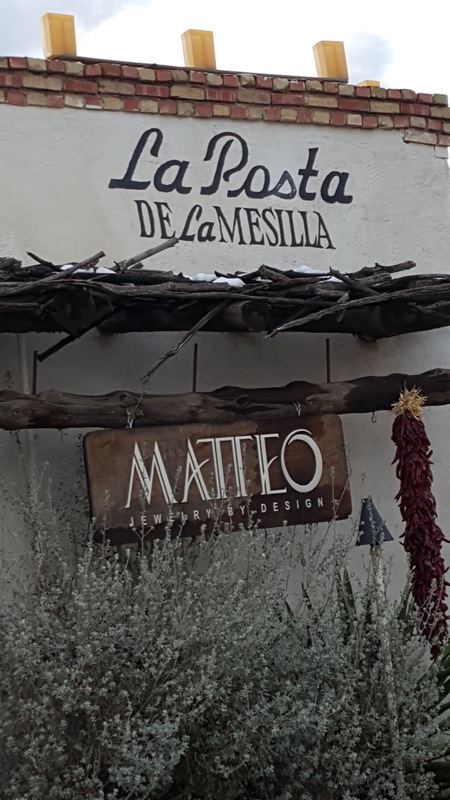 Back in the 1800's La Posta was a stop on the old Butterfield Trail. 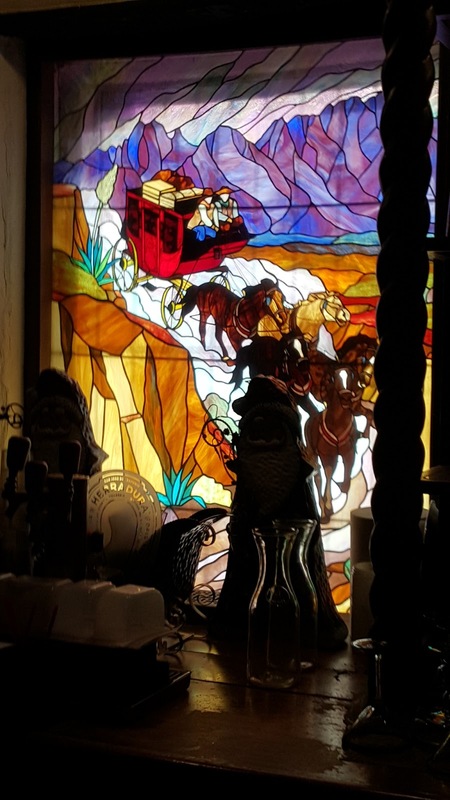 La Posta is the only building left on the trail and this stained glass behind the bar shows a colorful picture of the old days. This unassuming building was once the capitol building of Arizona and New Mexico. 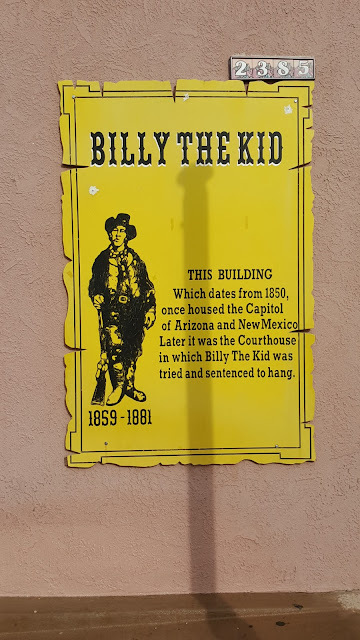 And our fascination with bad characters makes it more famous as the courthouse where Billy the Kid was sentenced to hang. We love the style of these old buildings. 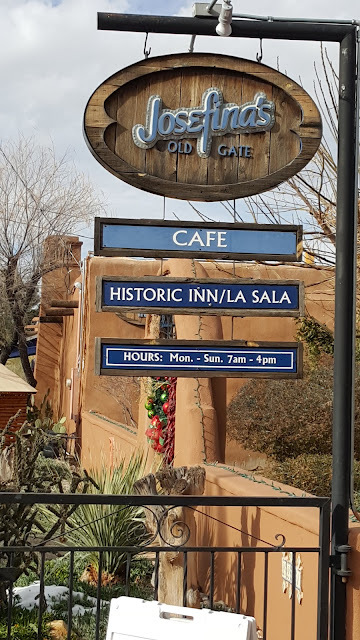 This inn is still functioning as an inn and cafe. Some great old wood gates. Inside these old buildings you will also see open branches supporting ceilings. 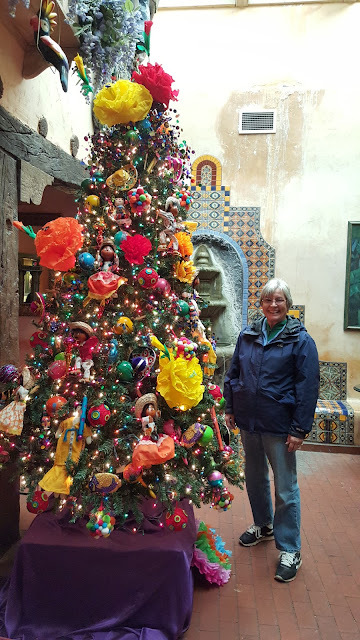 Note besides the holiday decorations , many buildings show chile ristras like the one to the left of Bruce. 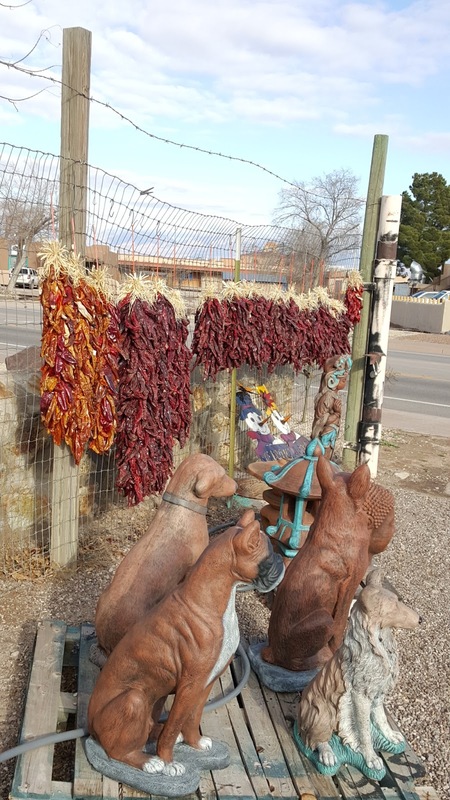 These are some for sale in a lot in Mesilla. A mural on the side of a building in Mesilla. 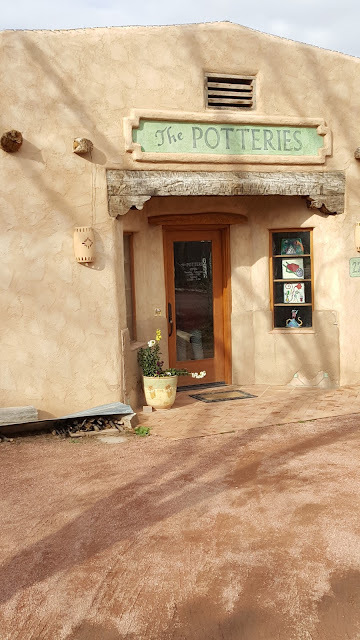 The entrance to a pottery shop. We talked to the owner and she showed us the kilns they used and some of the different artworks the three artists produce. We wished that we had more room for some of the artwork and pottery. 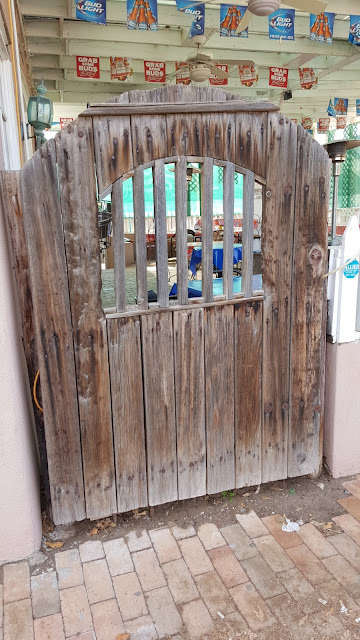 Another old gate at a cafe. Another day. 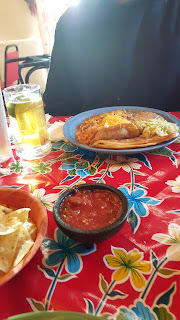 Jan and I stopped at the St. Clair Bistro. St. Clair is the largest wine producer in New Mexico. 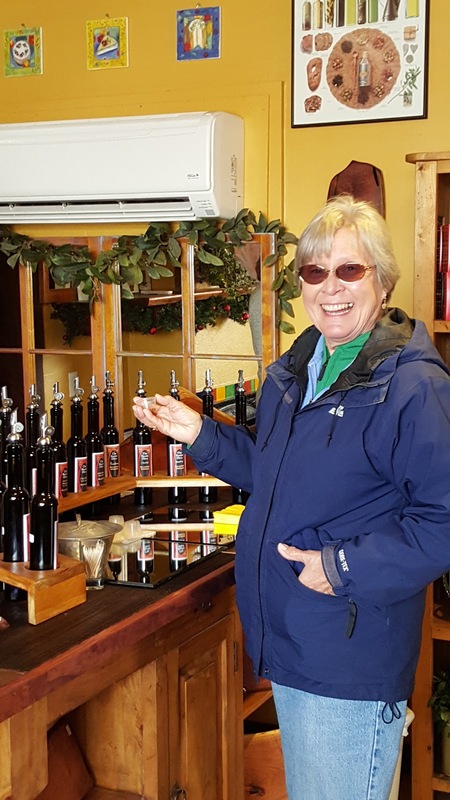 The original owners arrived from France and were quite happy with the area for producing wines. 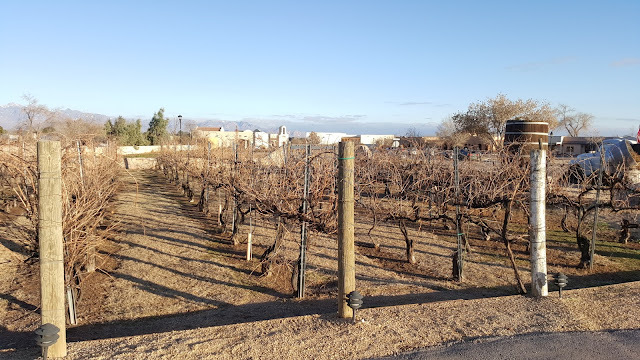 These are just a few vines at the Bistro, but the main hundreds of acres are located west of Deming. Besides a wine tasting, they offered a great menu including a cheese nosh plate with all kinds of cheeses from blue cheese to cheddar, to sage , grapes, crackers, and chocolate. The following is a link to the St. Clair website. 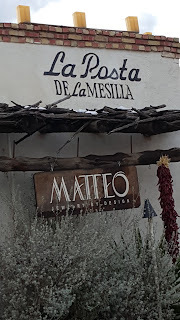 You can click under Bistros and look at Las Cruces for wine flights and menus. Pictures of the cheese nosh are under the wine flight menu. And on the way home, the sun highlights the mountains.